Arizona is home to one of the most famous, or infamous, graveyards in Western history – Boothill. For all you Wyatt Earp and Doc Holiday fans, Tombstone, AZ is the place to visit and you can’t pass up the graveyard. The city of Tombstone was one of the last wide-open frontier boomtowns in the American Old West and produced $40 to $85 million in silver bullion from 1877 to 1890 and had a population that grew from 100 to 14,000 in seven years. But with growth and wealth also came corruption, theft and political differences. And then of course the gunfight at the O.K. Corral, in a nutshell. Before being replaced by the current cemetery, Boothill was home to up to 300 deceased, most of which met untimely and unnatural deaths, including Billy Clanton, Tom McLaury and Frank McLaury (the three men shot at the O.K. Corral). With so many violent deaths, Boothill’s Graveyard has a reputation for supernatural activity. Visitors commonly sense a feeling of uneasiness and unusual cold spots, even during the hottest of the Arizona’s summer months. Not to mention various apparitions that show up in visitor’s photographs. Cochise Stronghold is a canyon in the Coronado National Forest in the southeastern corner of Arizona and is open to hiking, camping and climbing. But in the mid 1800s, the area was home to the Chiricahua band of Apache Indians, led by the Apache Chief, Cochise. After many years of resistance to the American intruders, Cochise finally made peace with his enemies and retired to the Chiricahua reservation. He dies of natural causes in 1874 and was laid to rest in a secret crevice in the Dragoon Mountains. Only his people and a white man by the name of Tom Jeffords knew the location of his grave. Visitors to the Cochise Stronghold believe to have seen the warrior – a man in Native American dress with long black hair is often seen roaming around the hills and campers have reported hearing a tune echoing among the rocks and seeing a man with a flute sitting atop one of the towering peaks. (b. Thomas Hezikiah Mix) was an American film actor, staring in a reported 336 films of which all but nine were silent. He defined a genre of cowboy actors that followed him and was considered a Western movie megastar of his time, influencing other stars of the silver screen such as Ronald Reagan (yes, President Reagan) and John Wayne. But on October 12, 1940, the 60 year old Mr. Mix was in Tucson, AZ visiting the Pima County Sheriff, Ed Nichols and then spent some time at The Oracle Junction Inn, a popular drinking and gambling establishment. On Arizona State Route 79, driving his 1937 Chord 812 Phaeton, Mix came upon some construction barriers in front of a bridge that had previously washed out by a flash food. A work crew watched as he was unable to break in time, swerve and rolled his car into an arroyo. His body was pinned underneath and killed almost instantly. Witnesses report he was driving upwards of 80 MPH. Today, as you’re traveling between Phoenix and Tucson along Hwy 79, you will see the wash named after him “Tom Mix Wash” and the memorial set up in his honor at the crash site. A plaque on the memorial reads “In memory of Tom Mix whose spirit left his body on this spot and whose characterization and portrayals in life served better to fix memories of the old West in the minds of living men.” No reports of seeing Tom wandering the area, but you never know. Reavis was preparing for a trip to Mesa to buy seed potatoes. On May 6, 1896, Dalabaugh discovered Reavis had never made it to his destination, back tracked and found the remains of the old hermit just off of Roger’s Canyon in what is known as Grave Canyon today. He died along the trail about four miles south of his ranch around April 10, 1896. A grave was dug and Reavis’ remains were buried on May 7, 1896. 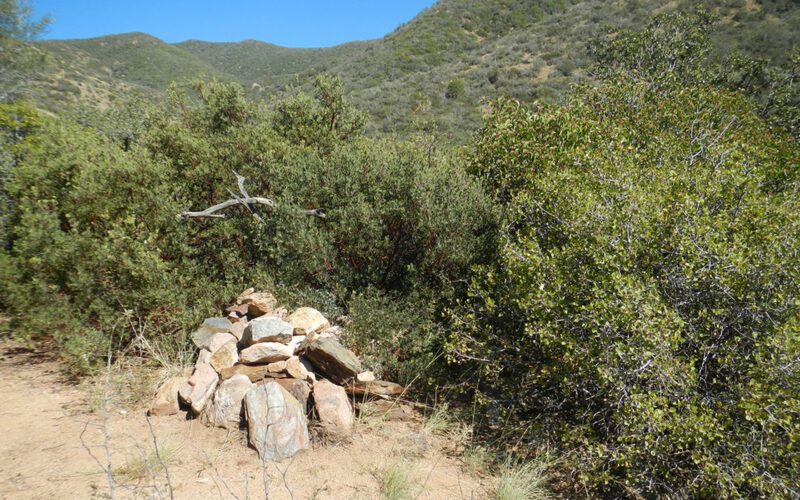 The grave is still pretty easy to spot along the trail to Reavis Ranch with stones piled high. Sometimes there is a make-shift wooden cross at the head of the grave. But have there been any ghost sightings? That depends on you. Believing is seeing after all! For more information about Elisha Reavis and the Superstition Mountains, click here or visit the Apache Junction Library. Yes, there are still libraries and people should visit them more often!